The increasing ubiquity and diminishing costs of digital technology enable us to solve these problems in a simple and straight-forward way. Wherever possible, we build on digital platforms and mobile connectivity in the developing world to make our books available to children and families who need them the most. We provide e-readers to schools in need through both sponsorships and sales. We actively curate books by African authors for our library. The more relevant and engaging a student’s first reads are, the more likely she is to continue learning and reading throughout her life. We also help African authors and publishers translate and digitize their titles and expand their audiences. We round out our library with wonderful titles donated by the world’s top trade and textbook publishers. We reach readers in 37 countries, providing them with over 6,000 book titles in 41 languages. Through these efforts and our partnerships with the private sector, teachers, education experts, and other organizations, we continue to work towards a world in which every child and her family have the books they need to improve their lives, the practice of reading is commonplace, and where illiteracy is a thing of the past. 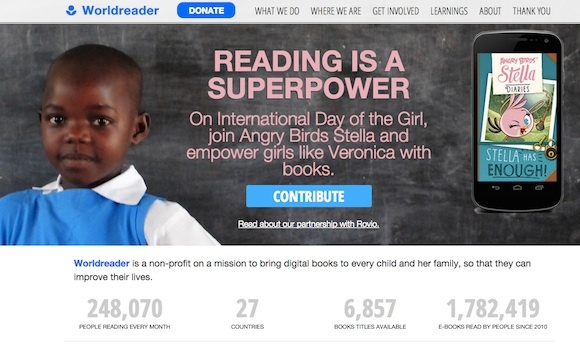 Worldreader: E-books on Cell Phones and Kindles in Schools.